Its easy and affordable to print glossy photos at home with Epsons Value Glossy Photo Paper. Providing plenty of choice, this versatile paper is designed to work with any rear feed inkjet printer, and comes in different sizes and pack volumes. 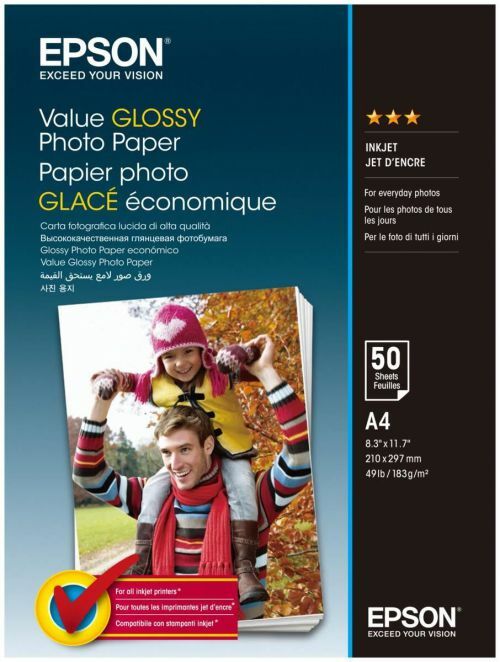 Epson provides a selection of photo papers to ensure theres the right product at the right price for every situation. The new 183gsm three-star Value Glossy Photo Paper takes pride of place at the entry level of Epsons range. For those looking for a professional or archival quality, Epson also provides the resin-coated 200gsm four-star Glossy Photo Paper, 255gsm five-star Premium Glossy Photo Paper, and finally the 300gsm five-star-plus Ultra Glossy Photo Paper.